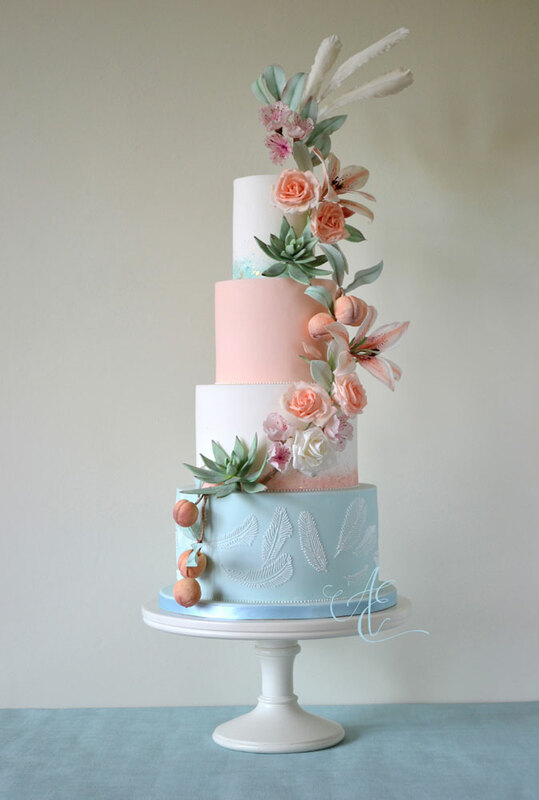 As a consequence of creating a wedding cake for a Falcon Manor bride just before Christmas I was delighted, in early January, when Emily (Falcon Manor’s ‘Dream Maker’!) 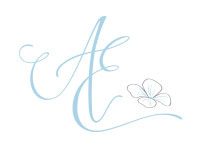 invited me to showcase my work at their first wedding fair of the year. 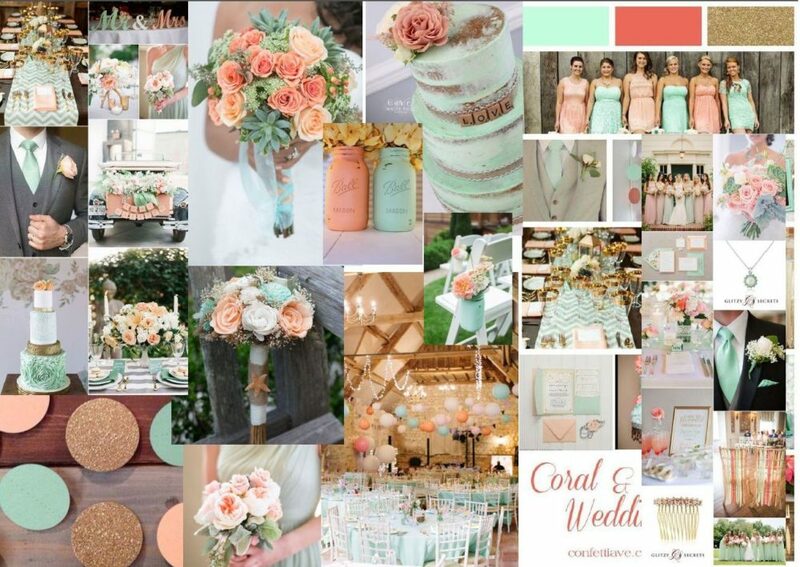 With a pastel mint, peach and white colour scheme this is their mood board from which I was asked to draw inspiration…. 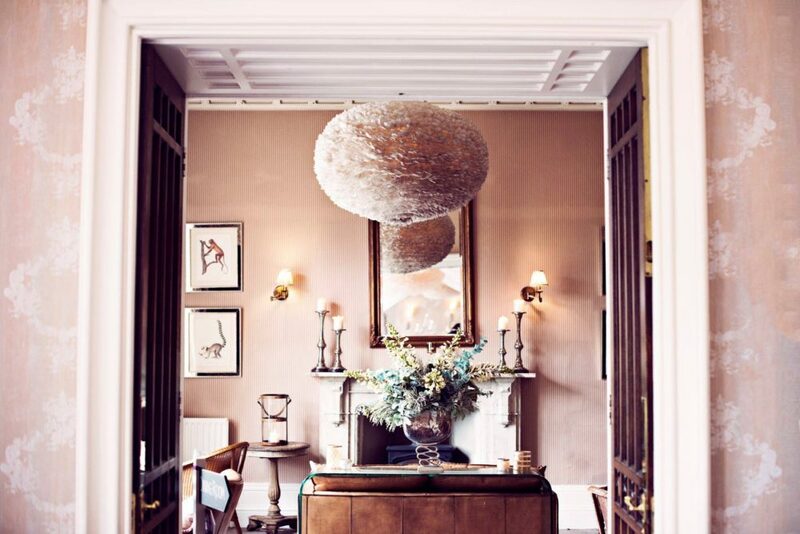 As one of my favourite features at Falcon Manor is their beautiful feather light fittings I just knew I would have to use them as inspiration too! I don’t tend to ‘wing’ anything. 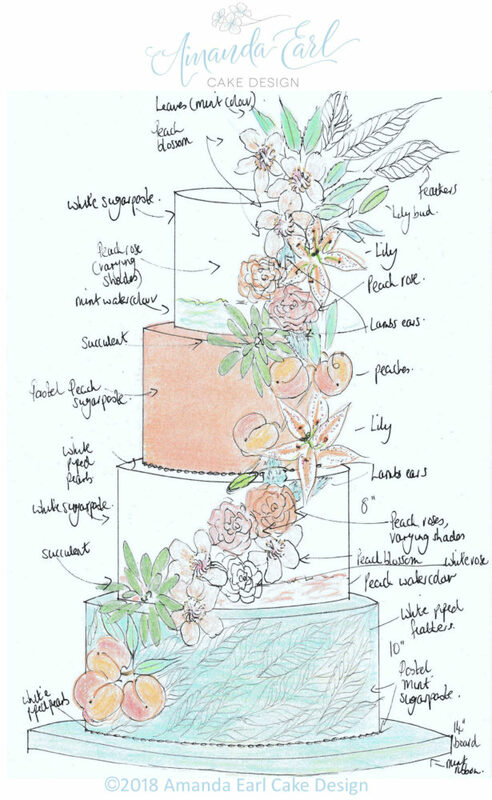 Preferring to have a plan to follow, I sketch all my designs in 3D half scale (well the cakes are 3D but I’m not the greatest draughtsperson so the flowers are 2D!) 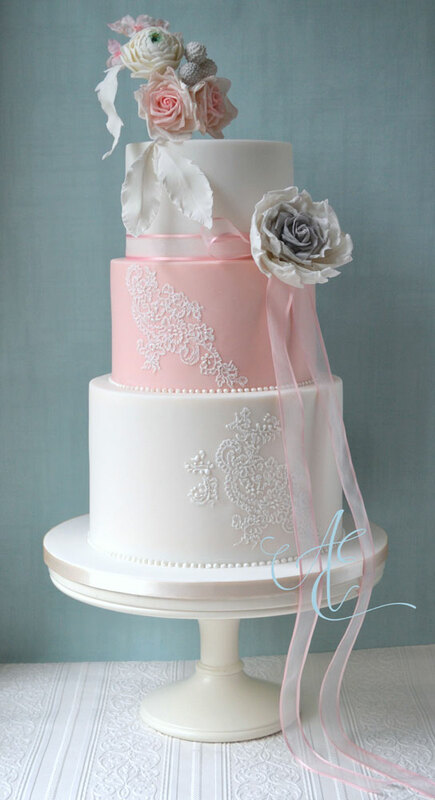 prior to starting any sugar work. 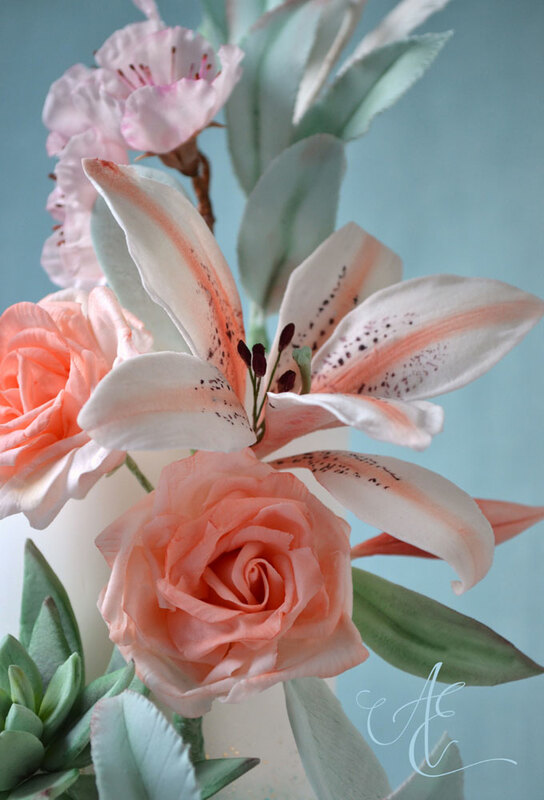 I find this allows me, when making the flowers and foliage, to gauge the correct size of blooms and length of stems so the proportions are correct in relation to the size of the cake. 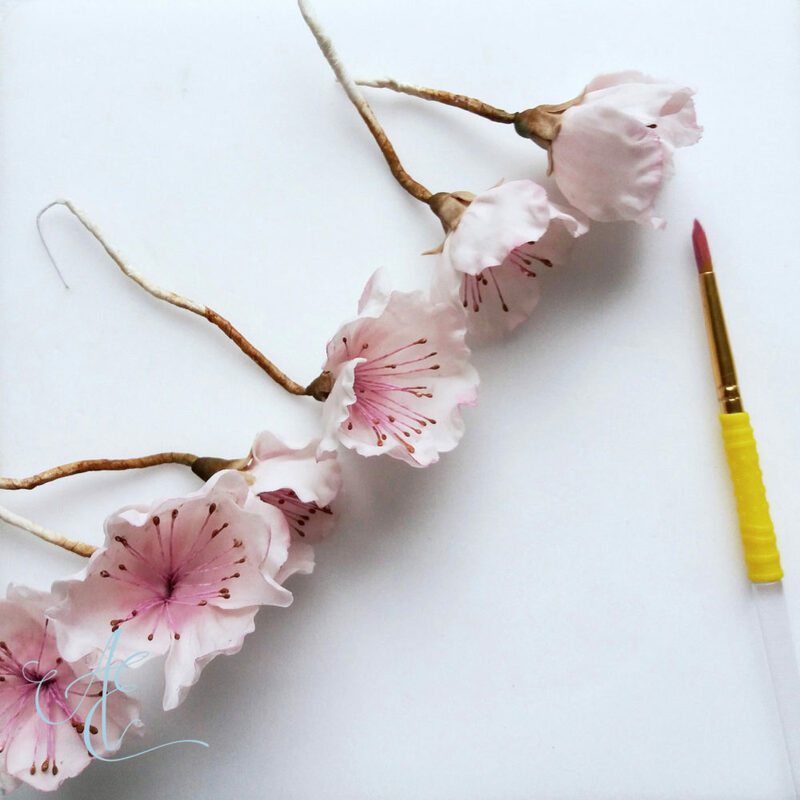 Once assembled into various arrangements they will all then flow and work well together. 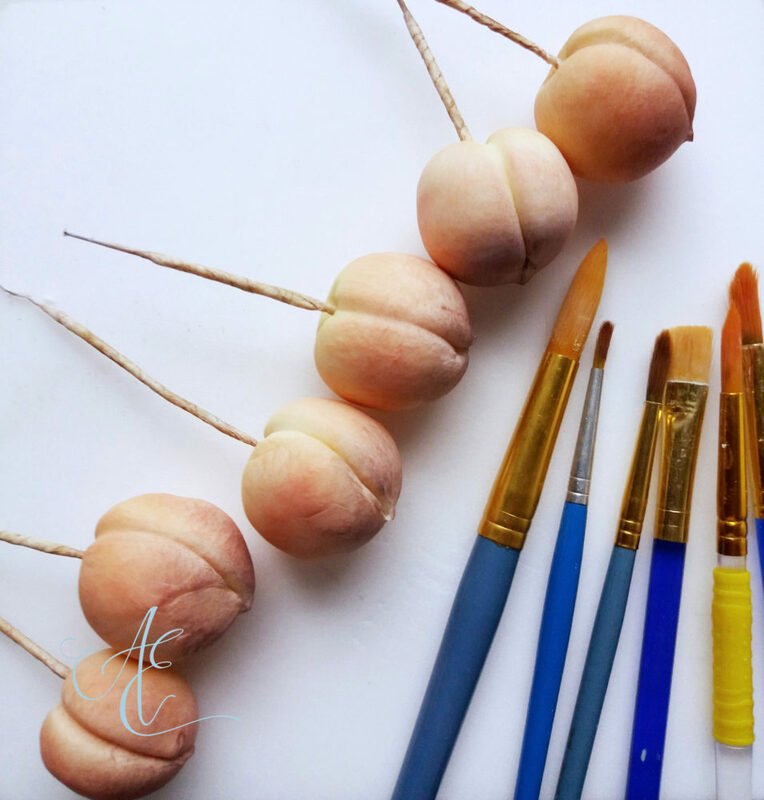 Firstly, interpreting the peach element literally, I decided to include some little sugar peaches! 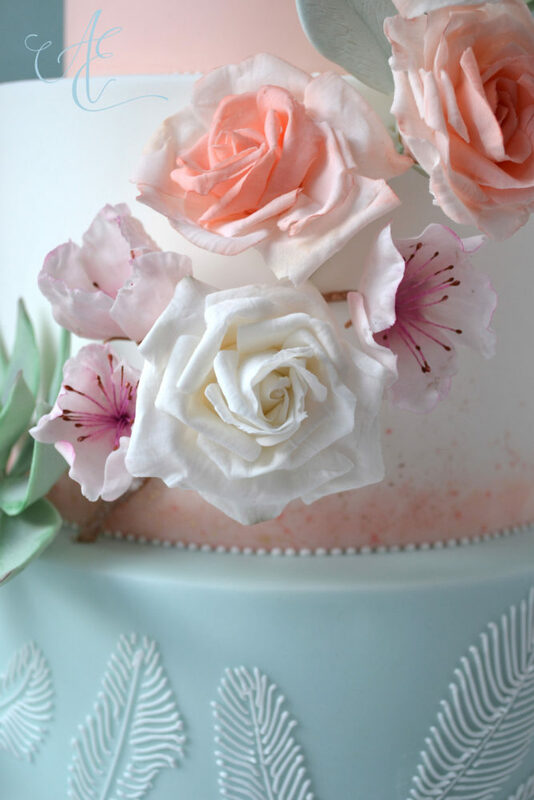 The beauty of creating sugar flowers is the artistic license. 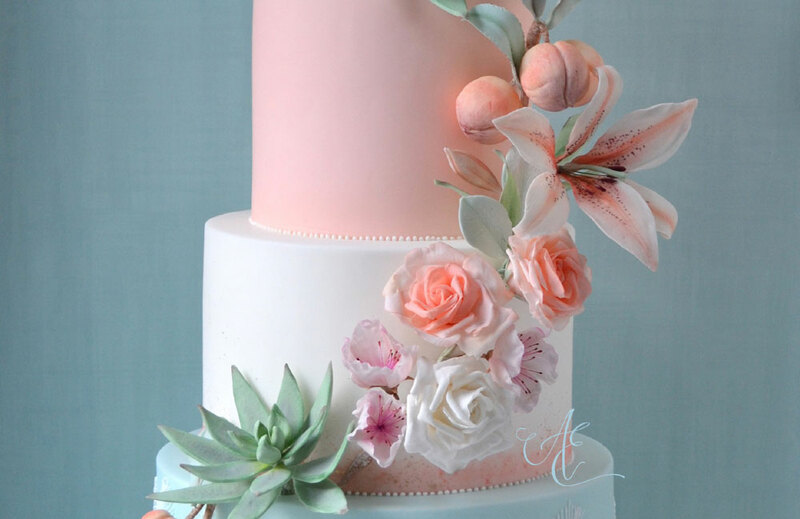 I added peach blossoms to accompany the fruit which would never occur together naturally! 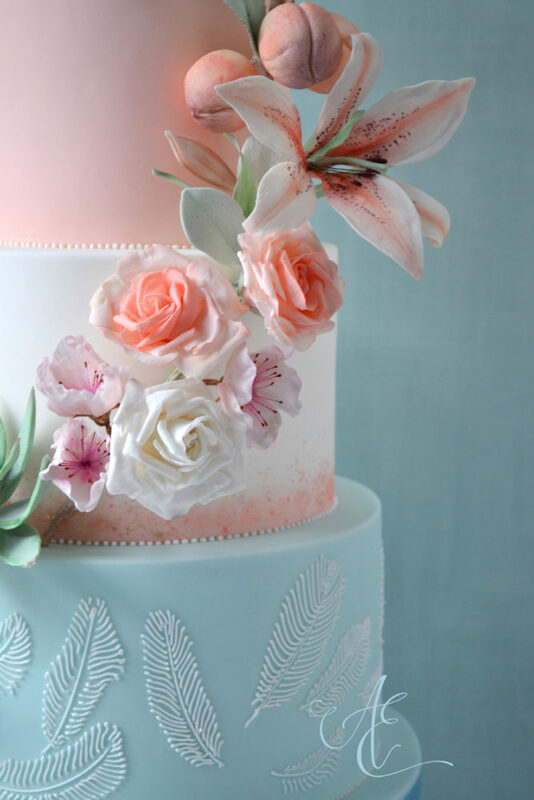 Next, taking inspiration from the various floral bouquets and displays within the mood board, I included roses and Easter lilies – blooms, buds and foliage. 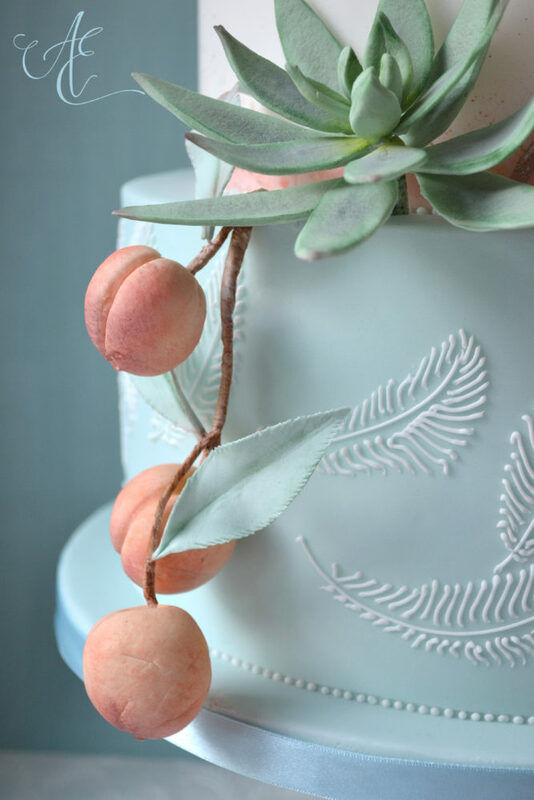 Next, I incorporated some succulents (specifically Pachyphytum-viride – no I can’t pronounce it either!) 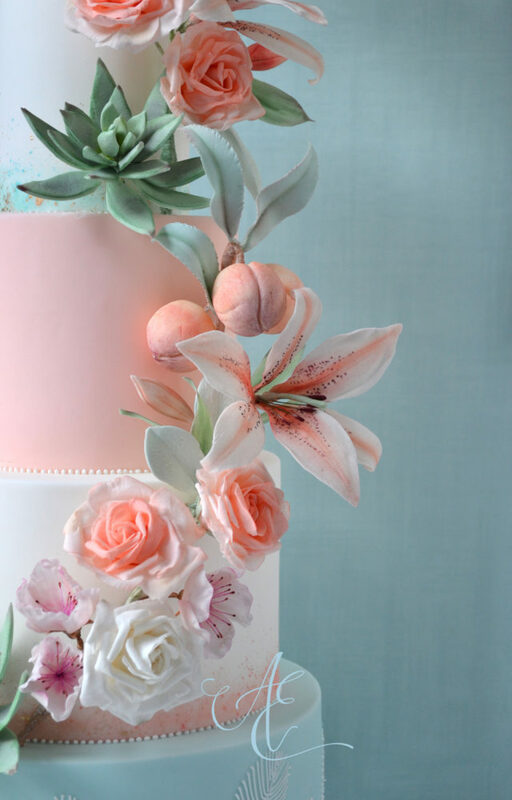 which nicely complement the profile of the lilies and are also found in the mood board. 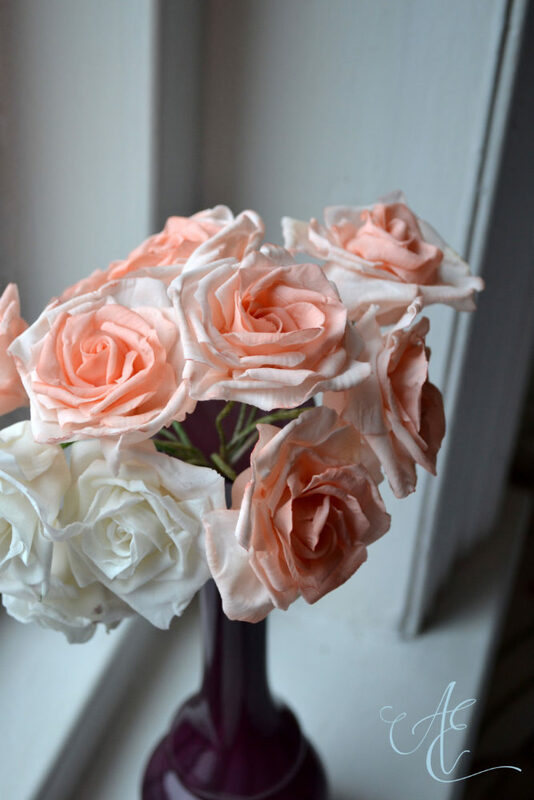 Finally, I added lambs ears – their minty colour would be just perfect! 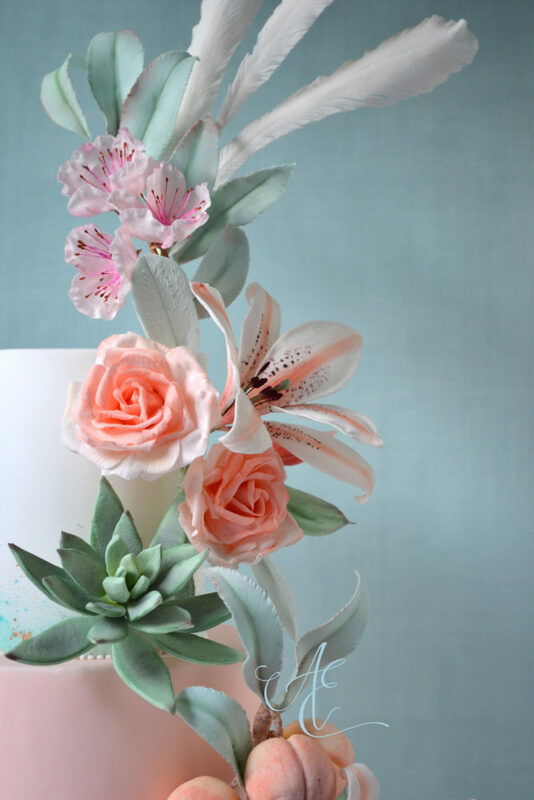 keeping the succulents separate due to their bulkiness. 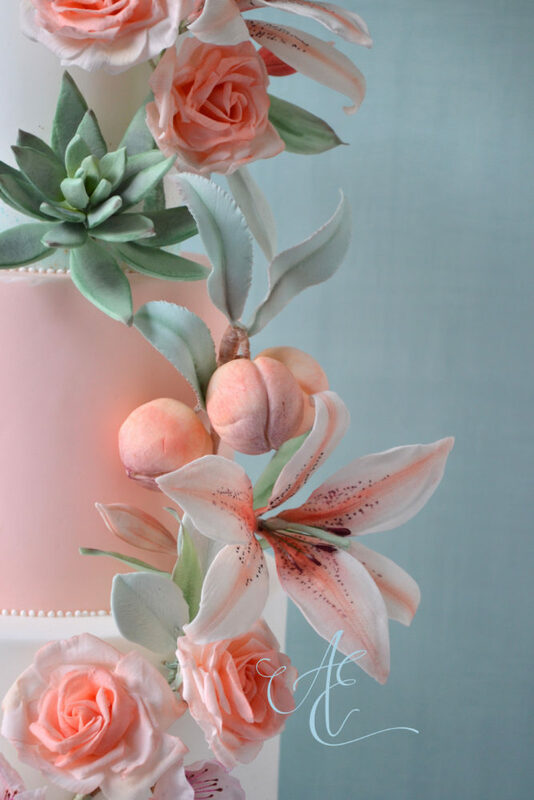 I then carefully (breathing not optional) attached the five branches and the succulents to the cake to create the feather/floral/fruit/foliage cascade. 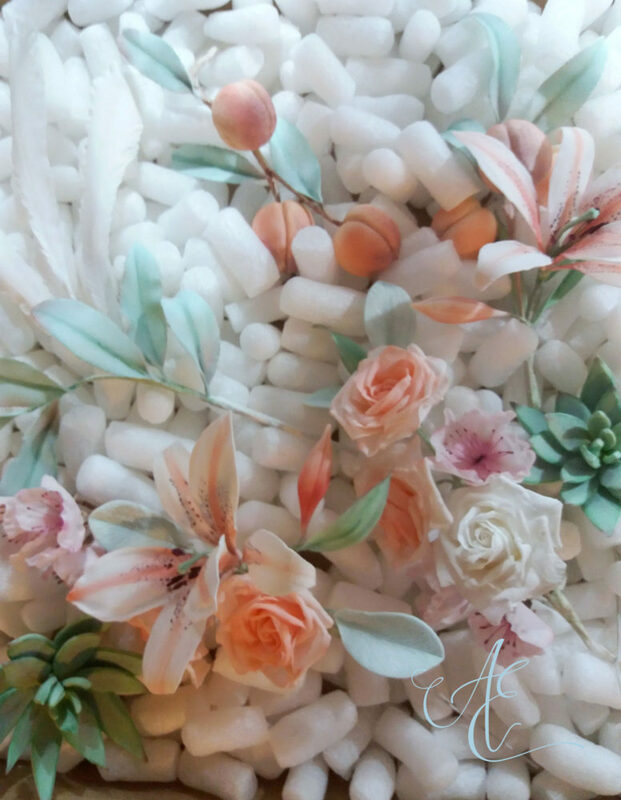 Lily: iced in pastel mint, peach and white with watercolour and gold accents, and a cascade of sugar florals, fruit and foliage. 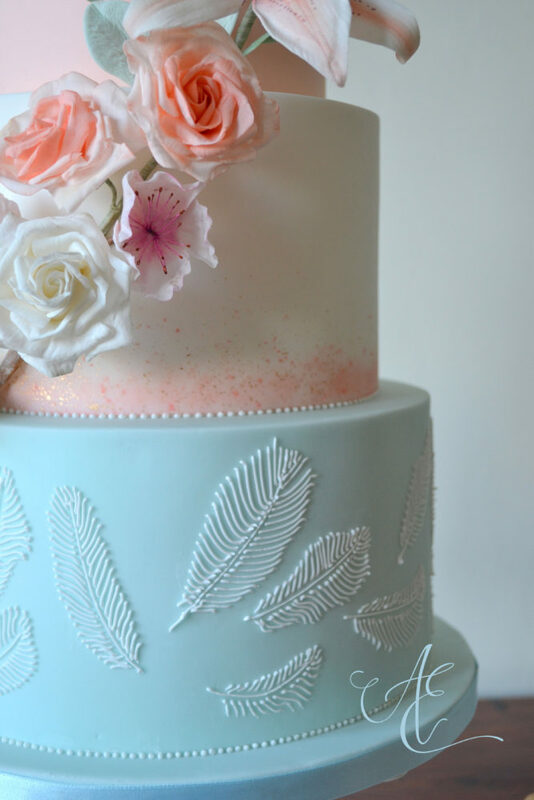 The sugar and hand piped feathers are inspired by Falcon Manor’s beautiful light fittings! 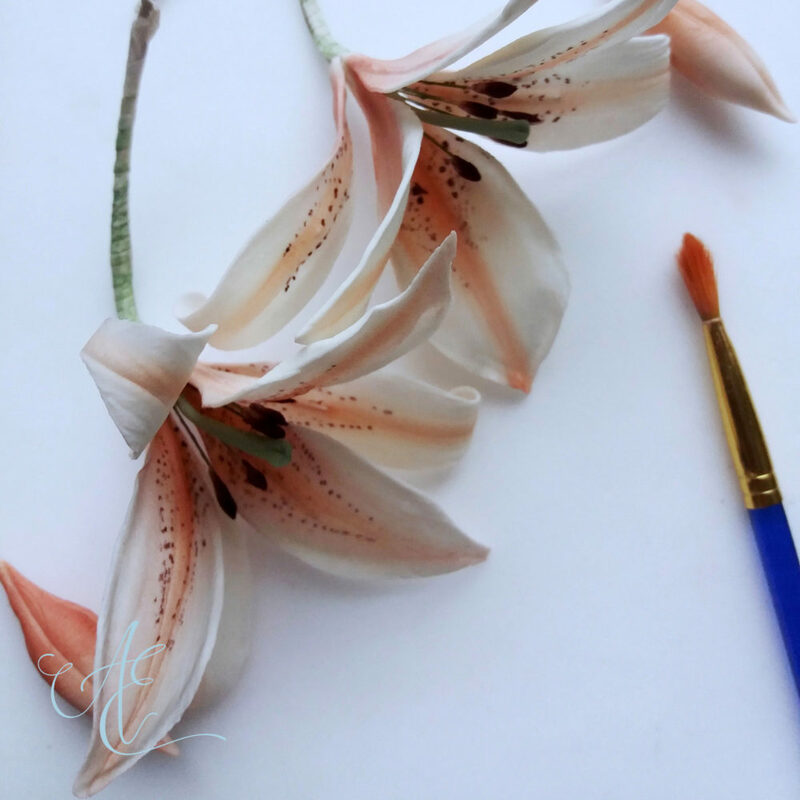 I’ll be showcasing ‘Lily’ at Falcon Manor’s forthcoming wedding fair on 28th January 2018! 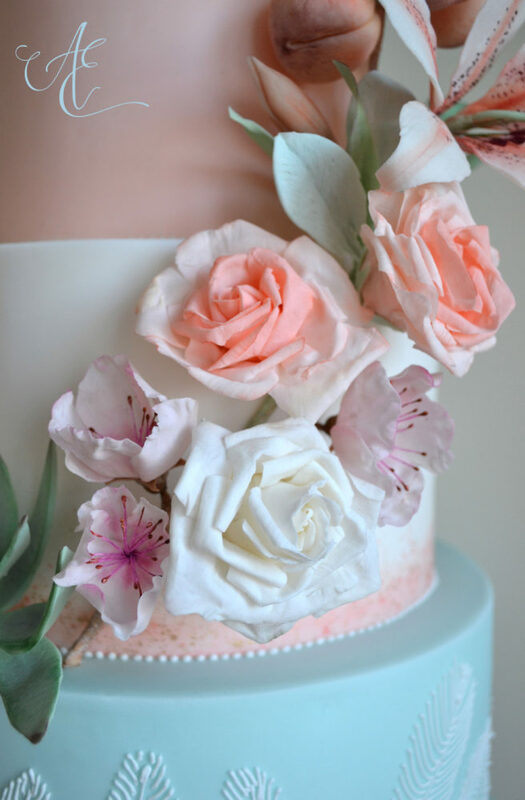 I’ll be sharing delicious cake samples too and look forward to meeting lots of lovely couples and talking all things wedding! 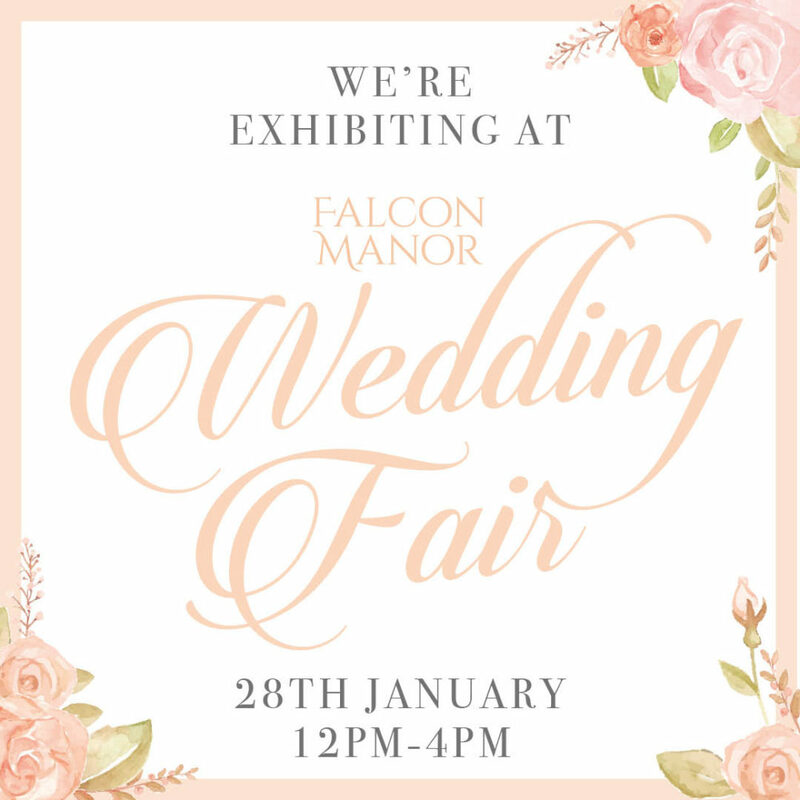 I received lovely feedback from both the couples attending the fair and Falcon Manor’s staff… check out Falcon Manor’s blog for their lovely words and for details of all the other fabulous suppliers!